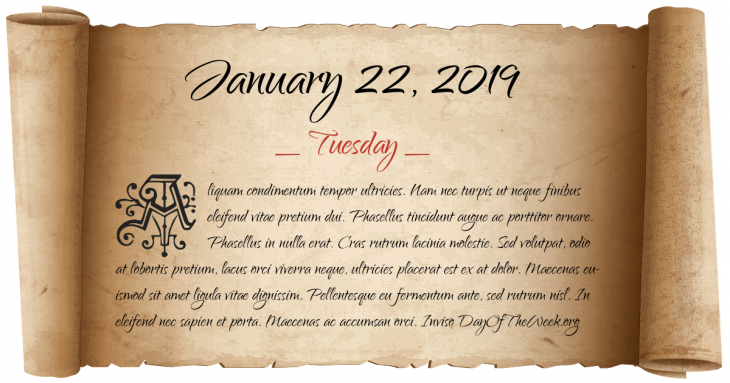 What Day Of The Week Was January 22? Eutychius is deposed as Patriarch of Constantinople by John Scholasticus. Operation Igloo White, a US electronic surveillance system to stop communist infiltration into South Vietnam begins installation. A gunman attempts to assassinate Soviet leader Leonid Brezhnev. The Supreme Court of the United States delivers its decision in Roe v. Wade, legalizing elective abortion in all fifty states. Gulf War: Three SCUDs and one Patriot missile hit Ramat Gan in Israel, injuring 96 people. Three elderly people die of heart attacks. Kmart becomes the largest retailer in United States history to file for Chapter 11 bankruptcy protection. New Year’s Day in Chinese calendar. Start of the year of the Wood Monkey in Chinese astrology. Who were born on January 22?